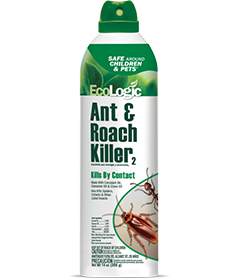 To kill ants, beetles, cockroaches, crickets and spiders (including black widows). Spray into hiding places such as cracks; crevices; openings around sinks, drains and pipes; around appliances; along baseboards and behind cabinets. Spray until wet. Contact as many insects as possible. Repeat as necessary. oors underneath furniture, sofas, chairs and beds. Do not saturate surfaces. Treat or thoroughly wash pet bedding, a primary hiding place for fleas. Repeat as necessary. Do not spray humans or pets with this product. Test an inconspicuous sample of fabric, rug, flooring or painted/stained surface for discolorations before use. Container Disposal: Do not puncture or incinerate! If empty: Nonrefillable container. Do not reuse or rell this container. Place in trash or offer for recycling if available. If partly filled: Call your solid waste agency for disposal instructions. Never place unused product down any indoor or outdoor drain. If in eyes: Hold eye open and rinse slowly and gently with water for 15-20 minutes. Remove contact lenses, if present, after the first 5 minutes, then continue rinsing eye. Call a Poison Control Center or doctor for treatment advice. Have the product container with you when calling a Poison Control Center or doctor, or going for treatment. You may also contact 1-800-923-3623 for emergency medical treatment. Contents under pressure. Do not use or store near heat or open flame. Do not puncture or incinerate container. Exposure to temperatures above 120°F may cause bursting.